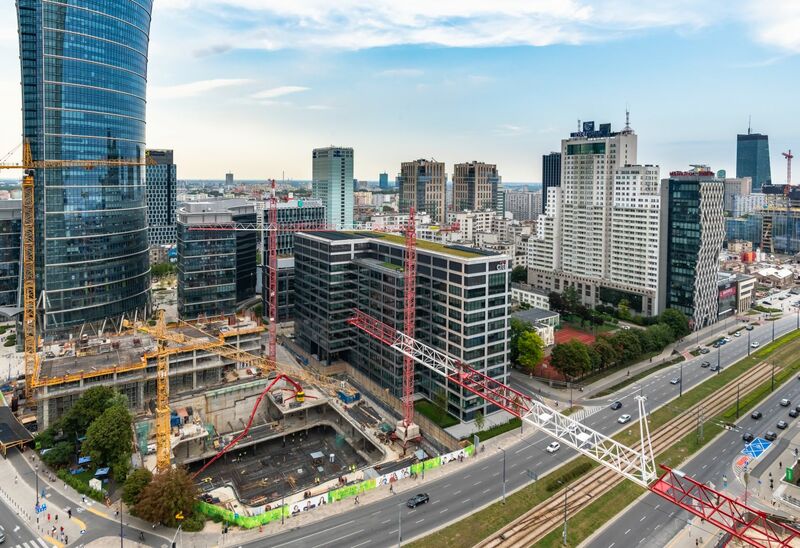 cmT has been involved as the project supervisor in the implementation of the 3rd highest building that completes the Skanska project at the Rondo Daszyńskiego in Warsaw. • a 37-floor skyscraper at Towarowa street, the implementation of which has started in the third quarter of 2017 and will have lasted to the first quarter of 2021. The building will be 138 m high, with spires reaching 180 m above sea level. The total area of the above-ground part of the Y building is 75,000 m2. • 13-floor building X completed in the period from the fourth quarter of 2015 to the fourth quarter of 2017. The aboveground part of building X is of 30,000 m2. • a 16-floor Z-building with an area of over 27,000 m2, implemented from the third quarter of 2017 to the third quarter of 2019. The Y building structure was designed in a column and slab system. The stability of the building will be provided by a reinforced concrete shaft, which is located in the central part of the building. Vertical loads from ceilings will be transferred to the shaft and reinforced concrete pillars. The reinforcement of the edge of the floor slabs is a reinforced concrete perimeter beam. The project assumed the implementation of the whole building in monolithic technology. The underground part of building A will be constructed in a trench, the housing of which will be 80 cm thick diaphragm walls. The Generation Park complex will be certified in the LEED system at the Platinum level. Z and Y buildings will also apply for WELL certification. Thanks to the use of innovative solutions, energy consumption for cooling the building will be reduced at least by 25%, and lighting by as much as 50%. In addition, it is expected to reduce water consumption by around 60% compared to local standards. An additional distinguishing feature of the building will be a green terrace on the 35th floor, at a height of 127 meters above the street level, with a view on the centre of Warsaw.